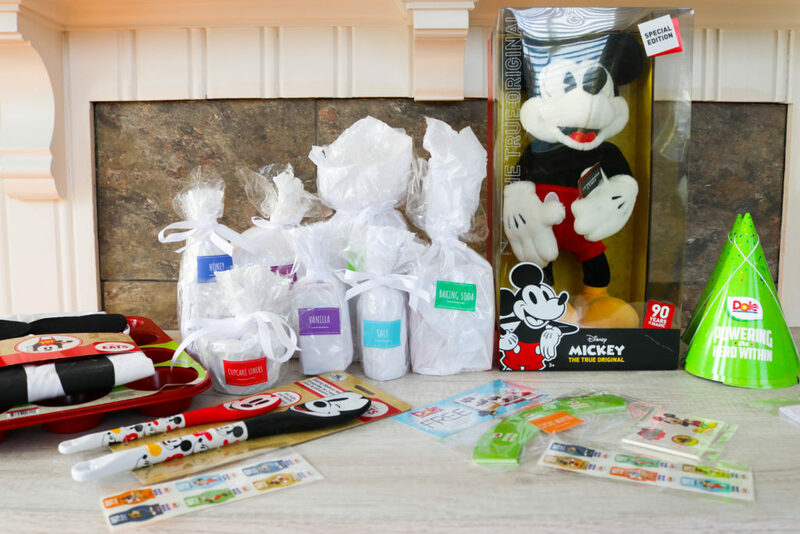 Thank you, Dole, for sending us this complimentary Celebration kit for Mickey’s 90th Birthday celebration! 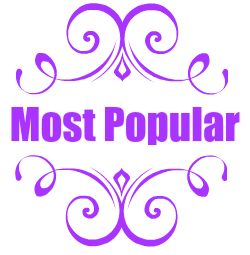 As always all words and opinions are 100% mine. It is no secret that our family loves Disney. 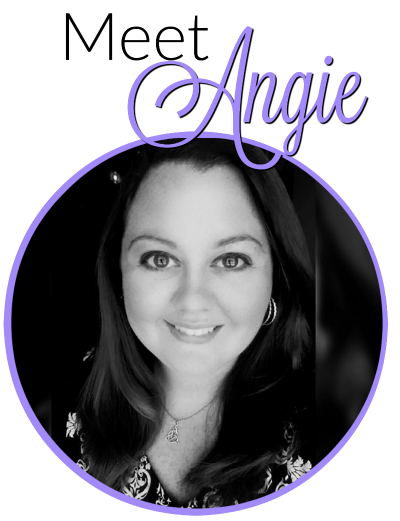 I grew up in love with Disney movies, I dreamed about visiting Neverland with Peter Pan, imagined swimming the oceans with the Little Mermaid and running around Jamestown with Pocahontas. 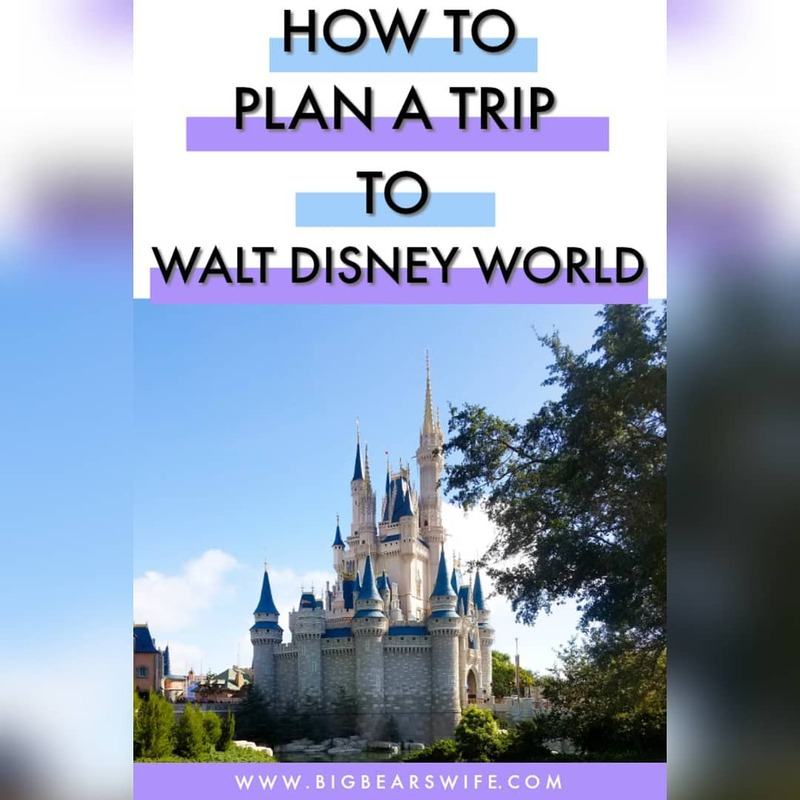 We went on Disney World vacations when I was little and I introduced my husband to Disney World vacations a few years ago and he fell in love as well. Then once our little guy came along our love of Disney grew even more! 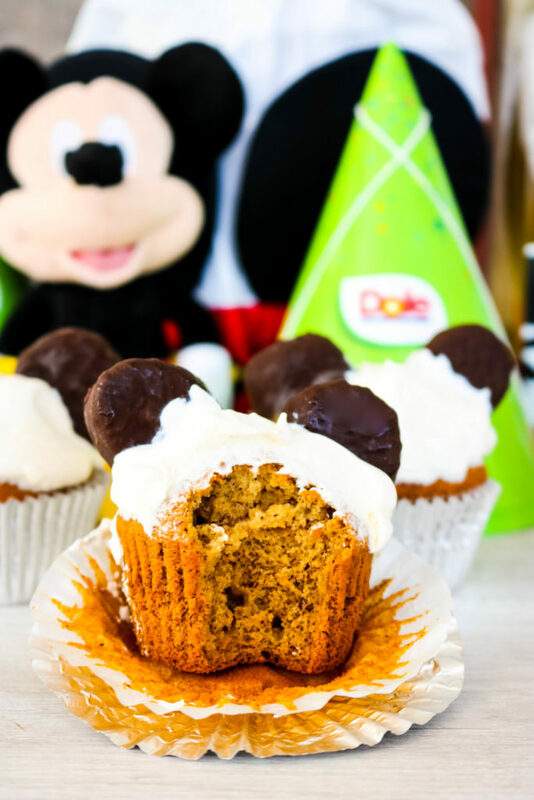 We even had a Mickey Pumpkin Party to celebrate his 1st birthday this year. 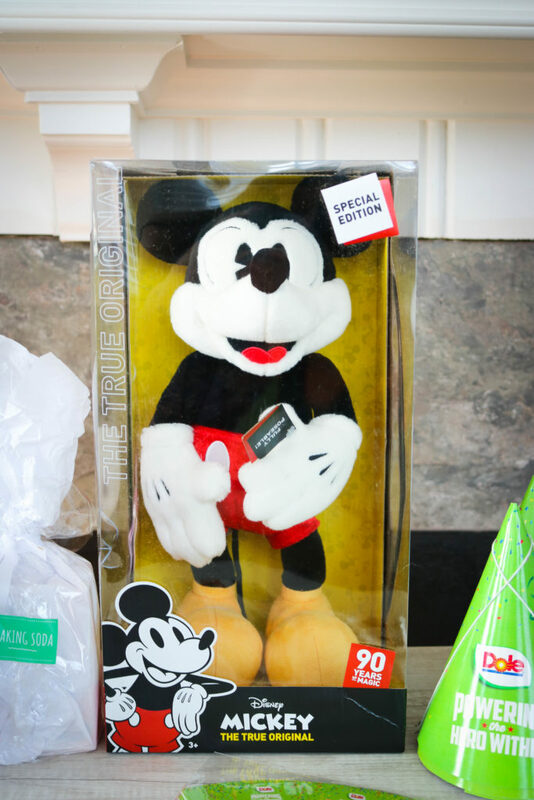 So when Dole reached out and asked me if they could send us a complimentary Celebration kit for Mickey’s 90th Birthday celebration, I was more than happy to say YES! Our gift package arrived this week and our little Jax was so excited to open his giant present. 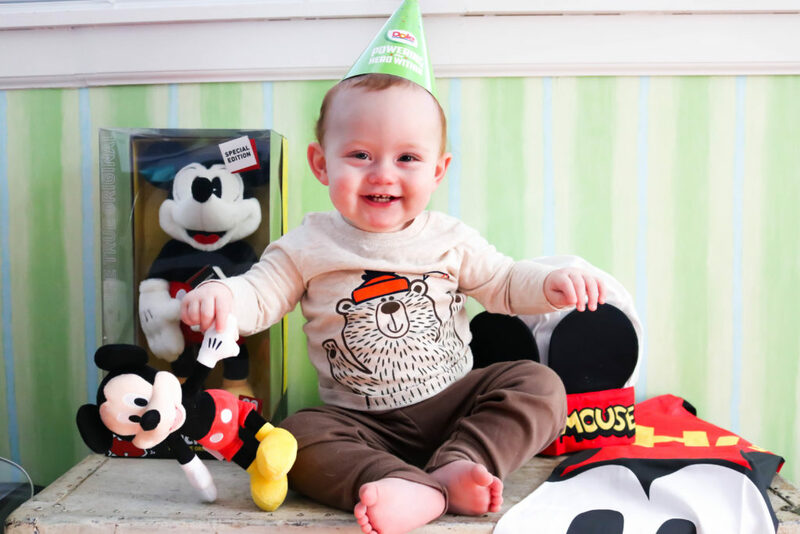 Dole and Disney were so sweet to send us all of these special Mickey goodies! Jax is over the moon excited about this giant Mickey Mouse….although this mommy wants to secretly keep it for herself. haha. 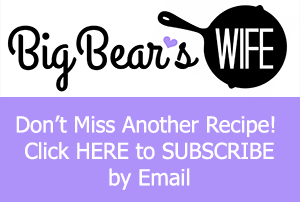 The also sent me a sweet new recipe for Mickey Mouse’s birthday that I’m sharing with y’all today! 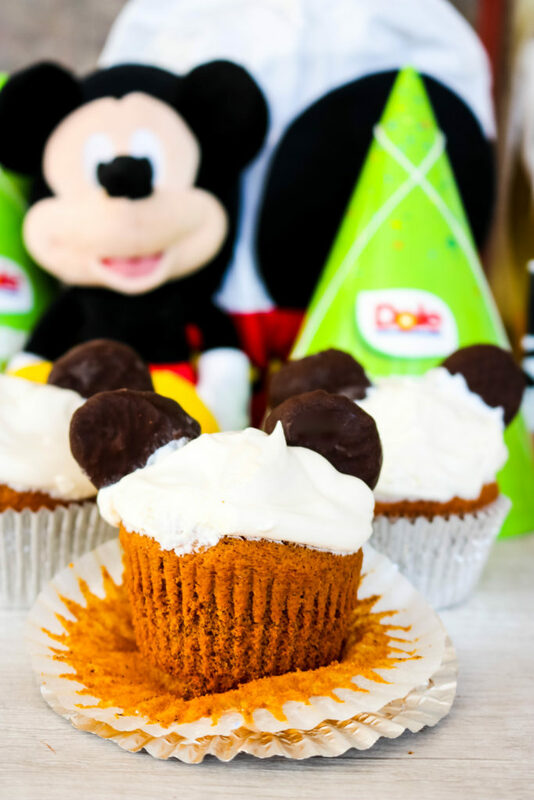 Because if you didn’t know…today is Mickey Mouse’s 90th Birthday!! 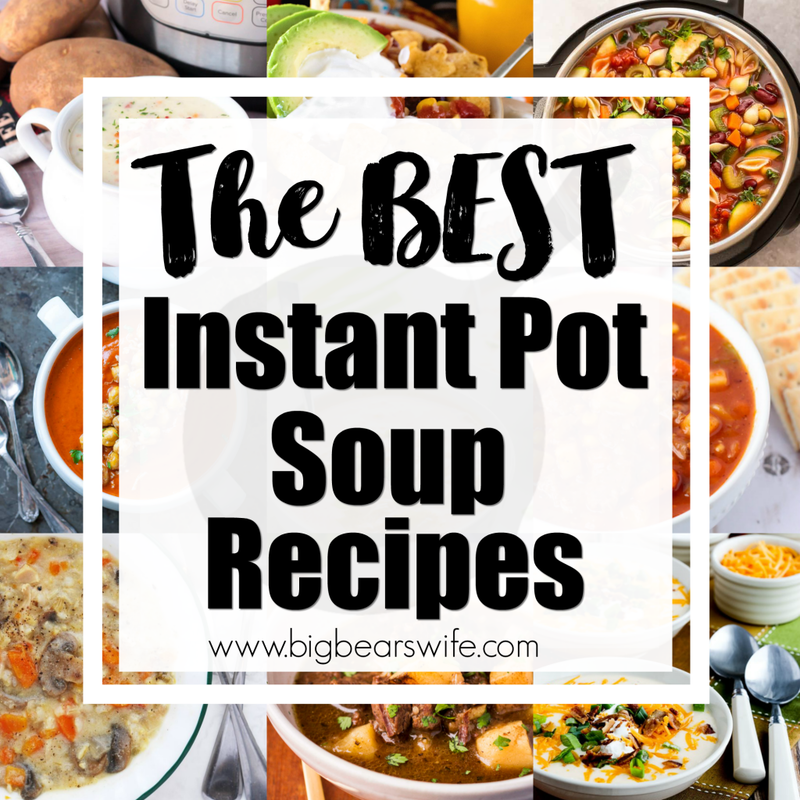 Well, actually I’m sharing a bit of an adapted version of the recipe they sent us. They were also sweet enough to send us everything we needed for the cupcakes! I just changed them up a tad. Originally these were Coco-Nana Birthday Cupcakes with a coconut whipped topping. Since we’re just semi coconut fans, I decided to use a regular whooped topping for these cupcakes instead. 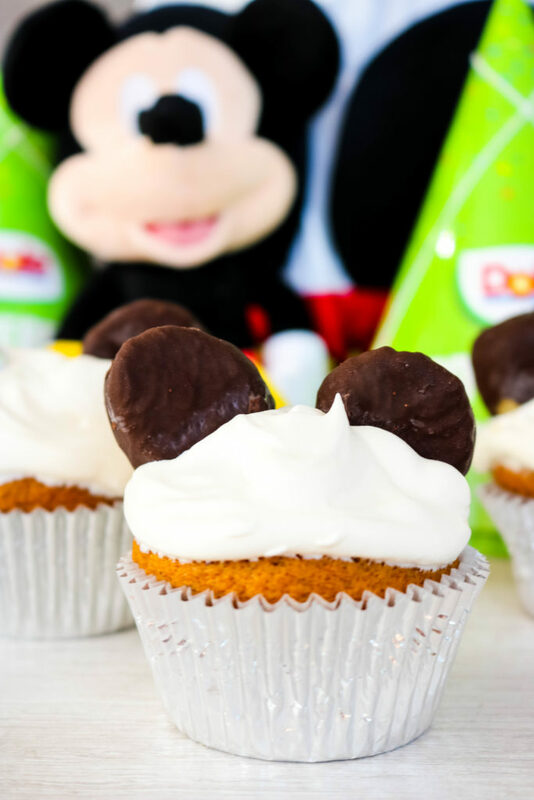 These Banana cupcakes are super easy to make, they’re decorated with a simple swirled topping and have the cutest little Mickey Mouse ears. 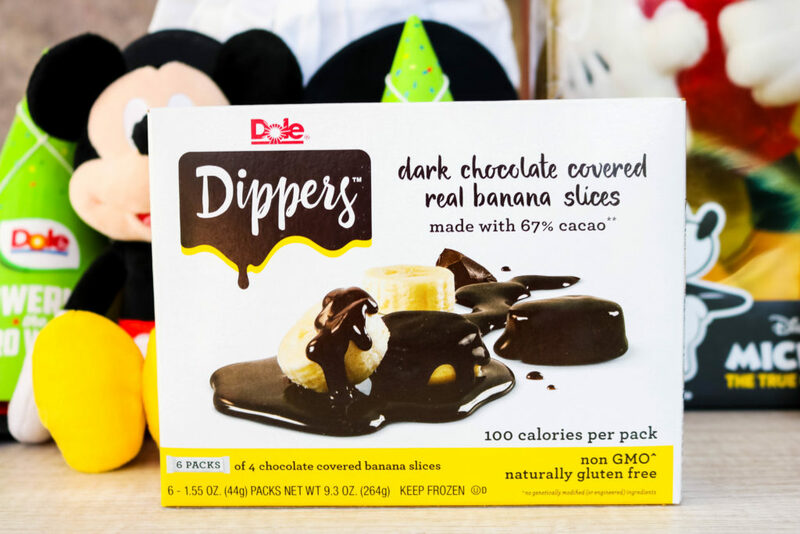 The Mickey Mouse ears are made using DOLE® Banana Dippers. 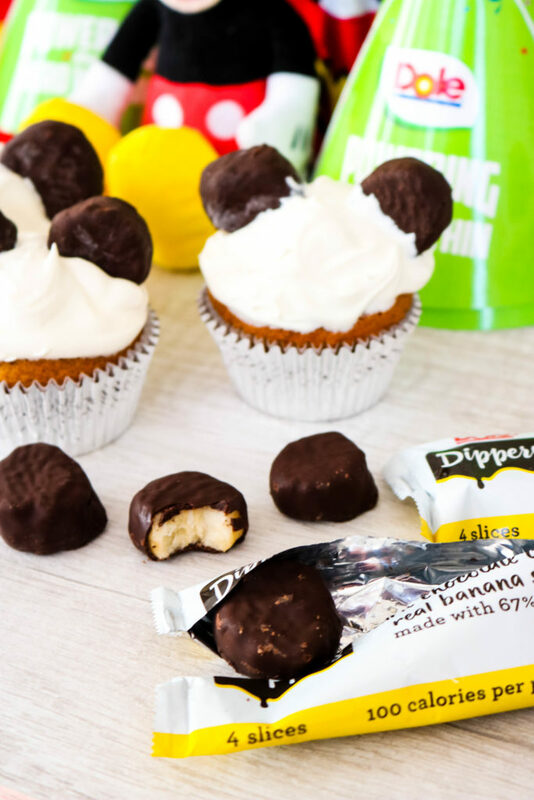 I first tried DOLE® Banana Dippers when I went to Mixed conference years ago and fell in love with them! They’re so good! 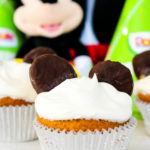 Let’s celebrate Mickey’s Birthday with some tasty cupcakes! I know Jax is ready to party!! Happy 90th Birthday Mickey Mouse! We love you! 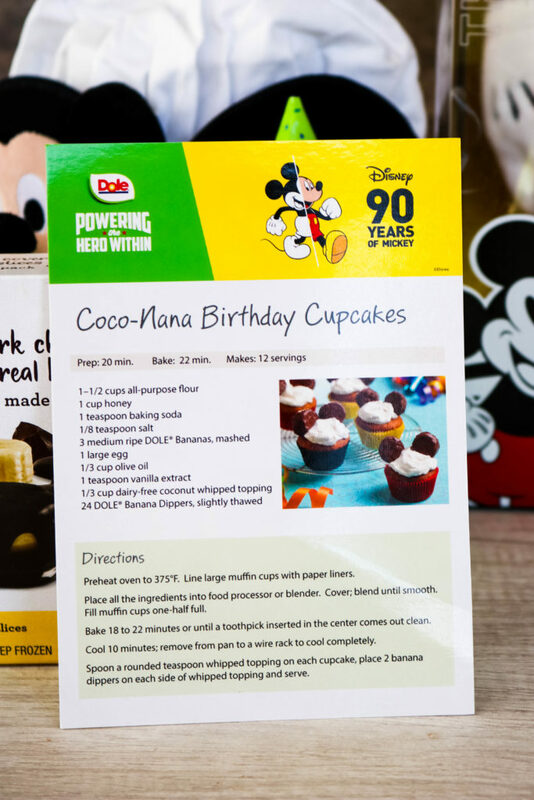 Dole also has 19 more Disney recipes for y’all too! 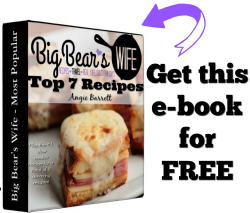 Place all the ingredients (EXCEPT whipped topping and banana dippers) into a food processor or blender. Cover and blend until smooth. Spoon a rounded tablespoon or so of whipped topping onto each cupcake. 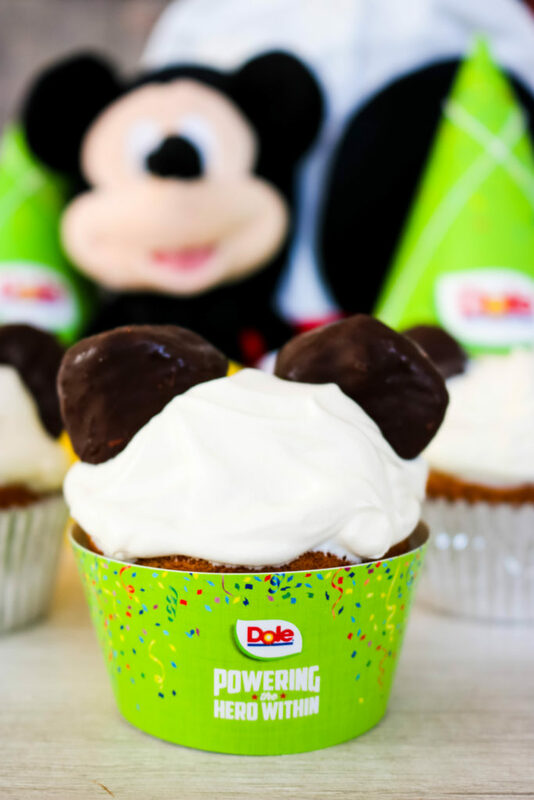 Place 2 banana dippers on each side of whipped topping to make Mickey's ears.